It’s funny how unusual collaborations lead to the creation of such interesting work. I guess over the past few years we’ve seen a heavy rush in content relating to the craft and design field, mainly focusing on makers and craftsmen. One particular field that’s used their talent to good effect is in the filmmaking department, lots of young independents have been jumping on the bandwagon and have documented various designers and artisans all over the world. This is good in a number of ways, it not only helps individuals like myself who’re searching for such content but also for those who’re actually making, revitalising a sector that was slowly dwindling due to industrialisation and manufacturing. They do say things go in circles, so I’m hoping lots more young people will take up different crafts and explore other avenues thanks to sites like our own. One platform known for its strong link with independents is video website Vimeo, it’s a destination for many to upload what they’ve made and share it with the world. The short film that I’m highlighting today is inspiring and reflects some of my own thoughts that I’ve had over the past few weeks, particularly those regarding ‘slow design’ and the natural evolution of time. I think it’s very easy to get caught up in the 24/7 world that we live in. I’m known to get snowed under myself, and let everything flood until I’m both physically and mentally drained (I’m sure many of you can relate). 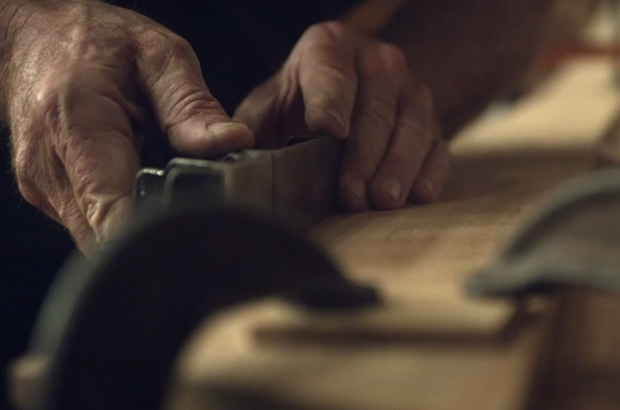 This video featuring Robert Darr, master boat builder for the Arques School, reminds us that we all need silence, quiet, and time to reflect. If you want to make something good, it’s going to take some time, so sit back and enjoy all the little details and natural processes that go along with it. What inspired me wasn’t necessarily the final piece, although I thought the boat was an absolute gem, it was the journey that the workers themselves go through. This is what truly counts in the end. The series itself currently consists of three short films, all directed by Strike Anywhere and edited by Matt Notaro for Olivari Olive Oil and agency twofifteenmccann. The others are worth a watch and document the working life of glass blower David Patchen and jewelry maker Kirsten Muenster, each have a similar vibe to this one seen below. I can’t wait to view the other short films that they release over the next year. If you’re interested to read more on the campaign that they’re running and the concept behind it I’d recommend viewing this NY Times article which was published last month.